The values in these two windows are different. Please upload a small testscene that shows the problem. It's happening in any scene. Not on my system. I need to see your color management settings etc. No special color settings. All default settings. On my Mac and my PC it works correctly, no difference between node and pop-up values. I have not changed any settings in Blender color management, should be at default. My system shows the problem too. Default cube scene, switch to Luxcore engine, add Constant color node, increase "brightness" with the vertical bar on the right. One of the two is not consistent, i think it is the one in the node. 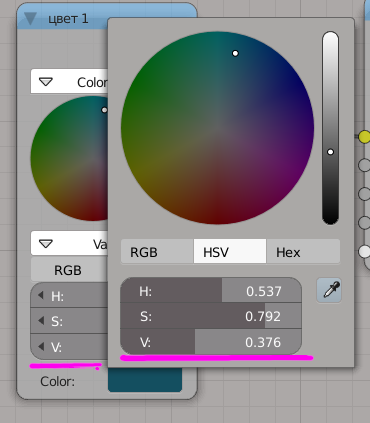 If color picker is chosen from the last picture above, it shows V near 0.5 (compare with the first attached picture). It has probably something to do with sRGB correction. In general it is pretty hard to apply meaning to HSV/RGB/Hex values. But if I can't reproduce it on my end, I can't fix it. edit: I found a scene where I can reproduce it.